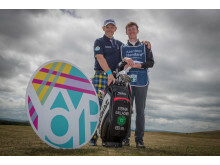 17 year old Cameron Gallagher was chosen to caddy for Stephen Gallacher during the pro-am of the Aberdeen Standard Investments Scottish Open. 2018 in Scotland has been dedicated as the Year of Young People and it coincides with a summer where Scotland will once again welcome some of the world’s biggest golf events as part of a portfolio of events which spans the country. The activity, which takes place at major golf events such as The 147th Open at Carnoustie and the Aberdeen Standard Investments Men’s and Ladies Scottish Opens throughout July, includes provision for ten youngsters to experience the thrill of playing alongside some of the biggest names in golf as well as the opportunity for a young person to caddy for Scottish golfer and former Ryder Cup player Stephen Gallacher gaining a once-in-a-lifetime behind-the-ropes experience. Six junior golfers chosen by Scottish Golf to represent First Minister Nicola Sturgeon in the pro-ams at the Aberdeen Standard Investments Men’s and Ladies Scottish Opens: Aaron Hall, Andrew Thornton, Rachel Foster, Ruben Lindsay, Grace Crawford and Evanna Hynd. 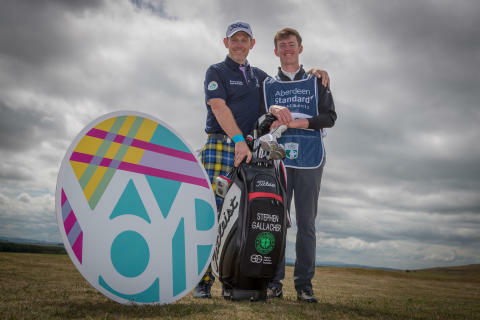 17 year old Cameron Gallagher from Longniddry was chosen by the Stephen Gallacher Foundation to caddy for Stephen during the pro-am of the Aberdeen Standard Investments Scottish Open. Cameron, who plays off a handicap of 2, has been a foundation member since 2012. 30 junior members from Gulllane Golf Club got the chance to play a 3-hole challenge with 10 European Tour professionals on the Wednesday of the Aberdeen Standard Investments Scottish Open. Young people have the chance to go free to Scotland’s golf events* across the summer, and in addition to the highlights above, each event includes a host of exciting come and try activities for both golfers and prospective golfers to get involved in. Scotland’s summer of golf in 2018 features no fewer than nine events taking place across six local authority areas and attended by around 330,000 spectators. 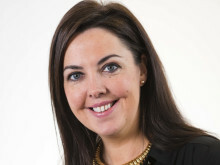 The events will be broadcast into more than 600 million homes worldwide, generate more than 11,000 hours of broadcast coverage and deliver an economic impact to Scotland in excess of £70 million. Young people co-designed the Year. A group of young leaders, Communic18, lead on all key decision making. 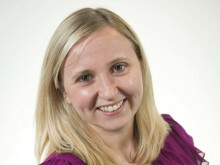 More than 500 Ambassadors based across every local authority are championing activity. 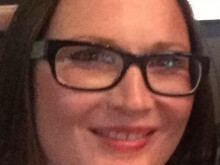 Month nine gets set to shine! September Year of Young People events continue to showcase the skills and talents of young people.